Hello everyone, my name is Murphy and I’m extremely happy to contribute to Moo’s Tennis Blog with a guest post from the Stuttgart final. 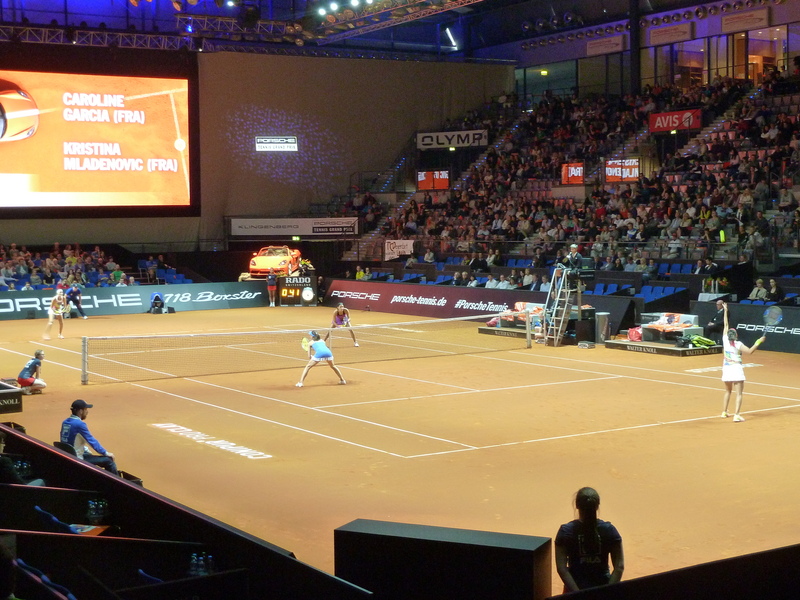 I know that a lot of tennis fans do like the WTA tournament in Stuttgart – that’s why I’m trying to write a small guide for those who plan to visit! As I’m living in the south of Germany, it was pretty easy for me to get to Stuttgart. However, my friend was travelling from Cologne (which is in the west of Germany) and her journey was as easy as mine. We were both travelling by train because Stuttgart is pretty well connected. If you need to come by plane, don’t worry: Stuttgart has its own (and small) airport that is not too far from the city centre. As soon as you are at the main station, you can take line U 11, an extra underground running for special events. It’s a circular line, so no worries if you go in the wrong direction. 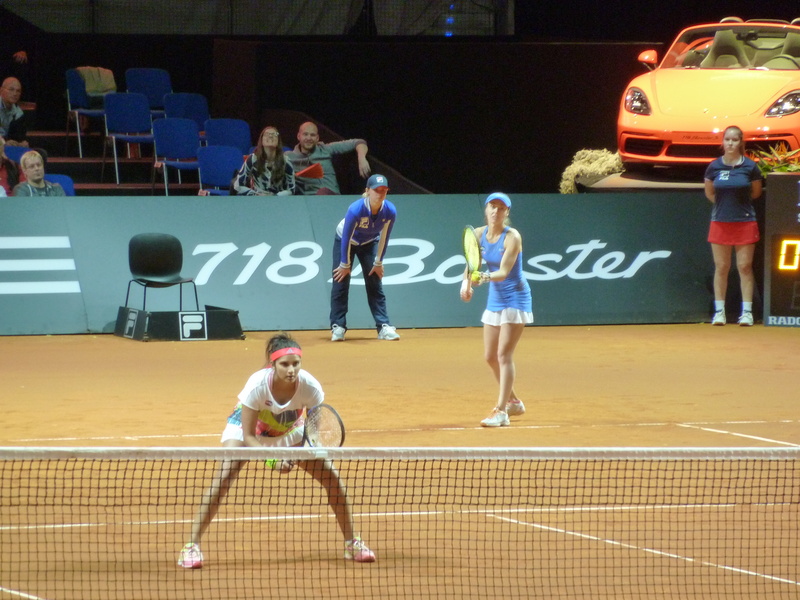 The stop is just next to the Porsche-Arena. Stuttgart is the state capital of Baden-Württemberg and has about 600.000 inhabitants. I’ve been there a few times and got the impression that it is a modern and nice city with a lot of shopping opportunities. As I didn’t need a place to stay I’m not able to give you any details but I always prefer using Airbnb. For those of you loving roller coasters, there’s the “Cannstädter Wasen” right next to the Porsche-Arena :-). In my opinion, the Porsche-Arena is quite impressive. Unfortunately, the only (tennis) venue I can compare it to is the stadium of the ATP tournament in Rotterdam. The latter is quite huge and the players seem to be far away. In contrast to that, the centre court of the Porsche-Arena creates the feeling of being very close to the players (I’ve only had a short look at Court 1 but it seems to be equally nice). From what I’ve seen, there are some snack bars in the Porsche-Arena with typical south German food :-). When we arrived, there was a lot of stuff going on – I think it was some sort of an award show? However, just before the final started, the Stuttgart ballet were dancing on the clay. I’m usually not the type of person to get involved into those kind of shows but I must admit that I did like it. Also, I had the feeling there was a lot of things to do for kids. Well – what can I say? As you know there were two German ladies in the final which – from my point of view – was really exciting. I’m a huge Kerber fan and was delighted when she won the Australian Open in January as I never ever (really) thought she could do it. I’ve always felt that she had it in her but I wasn’t expecting it. She was the reason why I started to watch tennis again as I randomly zapped into her US Open semi-final in 2011. I discovered my love for tennis at a really young age though watching tons of tennis matches with my dad (back to the glory times of Boris & Steffi). The other player, Siegemund, has not been very well known – only to die-hard tennis fans I guess. I’ve been following her for some time and always enjoyed watching her play. Therefore, I was overly excited to see her playing live in front of me. First of all, the match score was quite straight forward – 6:4 6:0 although it seemed much tighter in the first set. Siegemund came out on fire racing through the first three games only dropping three points and being strongly supported by the crowd. These games were an absolute pleasure to watch for every tennis fan as her game looks even more impressive when watching it live. However, I think Kerber needed some time to adjust and got a very important (and tight) hold for 1:3 whilst being favoured by the crowd. 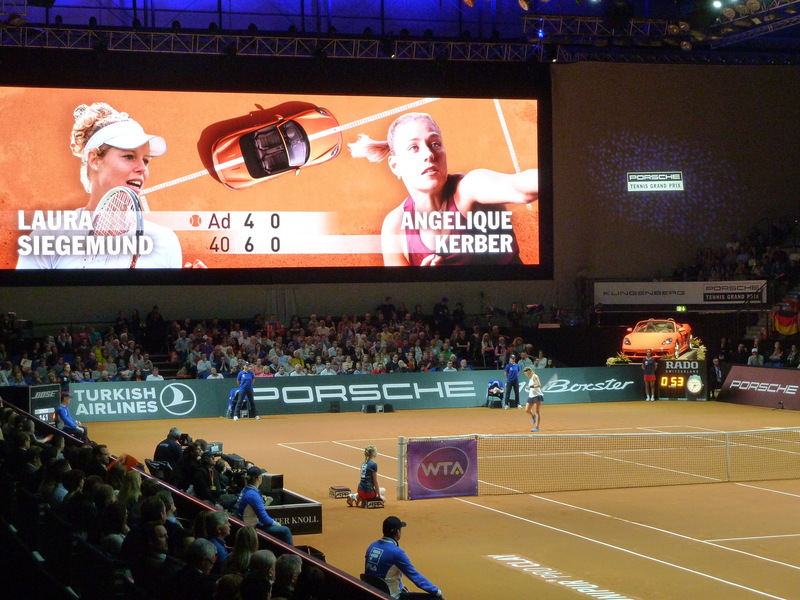 When Siegemund was serving again, Kerber raised her level and started to get more rhythm. She quickly had three break points but was only able to convert her third one. It seemed that Kerber would hold, but she didn’t as Siegemund played three great winners and broke straight back. The next game, in my opinion, was the turning point. The score got to 30-30 (from 30-0) and when Kerber earned a break point, she converted it with a beautiful backhand winner. After getting back on serve, it was one-way-tennis by Kerber. She easily held to love, broke and served the set out in quite convincing fashion. In summary, this was a good set of tennis. The crowd waved back and forth between the two players and always supported the one who was behind. With the help of the crowd Siegemund gave it her all at the beginning of the second set. However, after a lengthy game, it was Kerber breaking and getting first on the board. I did hope Siegemund would break back and get into the match but it seemed that all her power and her will were gone. After Kerber’s next service game, she took an MTO and went off court. She had her coach on court at 0:3* but it looked as if she had already given up. Kerber, on the other hand, was in full control and fought for every point. Her reaction after the last point was lovely to see and she was soooo happy after the match. We were a little sad though as we would have loved to see a longer match but, at least, we still had doubles to watch. In the doubles final, the no. 1 doubles team Hingis/Mirza played against the French pairing Garcia/Mladenovic. As a tennis fan, this was just great to witness: Mirza has a stunning forehand, Hingis’ net skills and on-court intelligence are second to none and both, Garcia and Mladenovic do play wonderful and aggressive tennis. However, the two sets were a little bit lopsided as Hingis/Mirza played great whilst Garcia/Mladenovic were not and vice versa. Unfortunately, we missed the match tiebreak since we had to go back to the main station to catch our trains. I’m so happy I went to Stuttgart – I couldn’t have spent my Sunday in a better way! Also, it was great to finally see Kerber live. Her ground strokes are so much more powerful than you would guess from watching her play on the TV, especially the crosscourt backhand is outstanding. If anyone wants to get more information on the tournament, the city or the journey – please feel free to leave a comment! 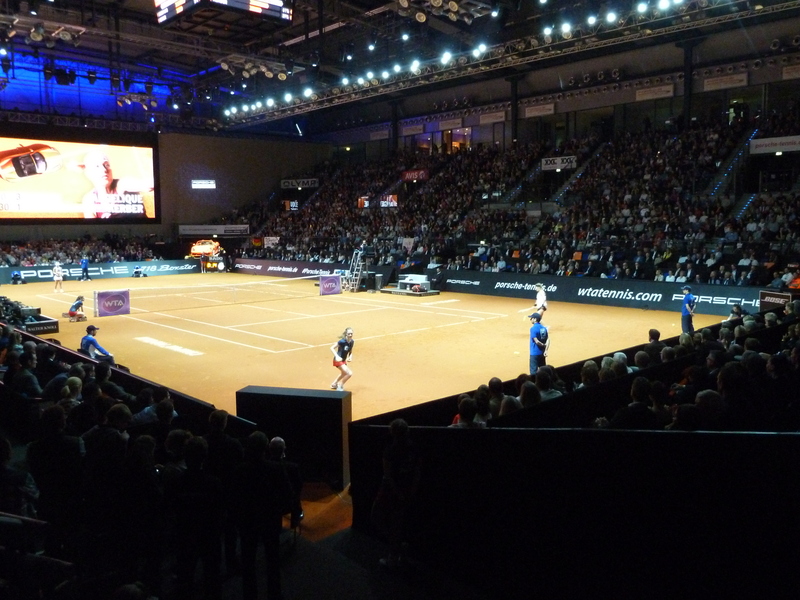 May 5, 2016 in Garcia, Guest Post, Hingis, Kerber, Mirza, Mladenovic, Siegemund, Stuttgart, WTA. Great post. Thank you for having taken the time to write it. Thank you so much – really enjoyed to share my experiences with you! @Wta_Follow: Do you mean if there are a lot of tickets available shortly before the start of the tournament or if it is easy to purchase tickets in general? We decided to go there in January, so quite early so i don’t know how easy or difficult it is to get some just before the tournament starts. As far as the purchase is concerned: It is very easy 🙂 There’s a link on the Porsche Tennis Grand Prix Website redirecting you to the purchase. You can pay online (debit card/credit card) and then you’ll receive the tickets by letter. I think that there is an online ticket option though were you can print your tickets.